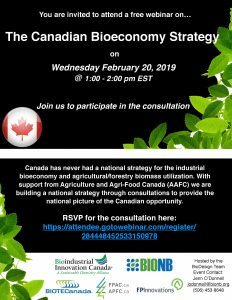 You are invited to attend a free webinar on The Canadian Bioeconomy Strategy. Join us on February 20, 2019 to participate in the consultation. Canada has never had a national strategy for the industrial bioeconomy and agricultural/forestry biomass utilization. With support from Agriculture and Agri-Food Canada (AAFC) we are building a national strategy through consultations to provide the national picture of the Canadian opportunity. As part of the BioDesign team, BioNB and BioIndustrial Innovation Canada have been coordinating events across Canada as they develop a National Bioeconomy Strategy. This industry consultation will build on gaps related to industrial agriculture. The team is gathering input from industry, research and association stakeholders from across the agri-business value chain. They would like to hear about the challenges faced by Canadian firms in the bioeconomy and what actions can and should be implemented to support this sector. In this webinar, the BioDesign team will present the foundation and rationale for the strategy they are currently working on and some of the results from the in-person consultation sessions that are currently underway. The presentation will be followed by a Q&A session. Participants will also learn how to provide their input on key priority areas and recommended actions for the Canadian bioeconomy as the BioDesign team builds this strategy. This webinar is intended to engage stakeholders who did not attend any of the in-person sessions held in January and February 2019.